Bermuda is a British Overseas Territory in the middle of the North Atlantic Ocean. It is fully self-governing in all areas except defense and foriegn affairs, where its intrests are represented by the UK. Bermuda is famous for the Bermuda Triangle, which is made up by conspiracy theorists. 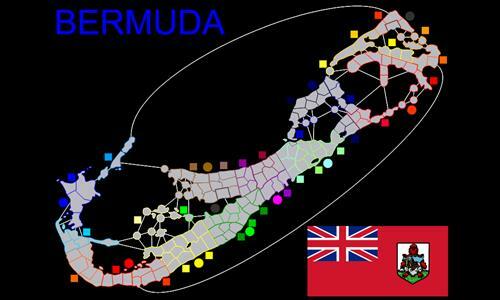 For this map, I've used the 9 parishes and the 2 municipalities of Bermuda as the super-bonuses. The territories are places, roads, parks, beaches, etc. loacted within that territory. Review by Little Blue on 12/22/2014. Looks great, clean lines and nice attention to detail. I'd suggest lowering the border on East South Shore Park just a smidge to make it more clear that it doesn't connect to Northeast Southampton. I'd also like to see each of the bonuses having a different color than their neighbor. East/West Warwick, East/West Pembroke, and the Parish at the top-right. I've created a version 1.1. I've lowered the boarder and fixed the missing connection. Now I just have to wait for Fizzer to accept it. As for the colours, I've left them as they are. I wanted the bonuses that are part of the same super-bonus to be similar colours so it makes it obvious which super bonus each bonus belongs to. I don't think the bonuses that are in the same super bonus are that hard to tell apart. Review by Nathan on 12/26/2014. Nice little map. I appreciate that you have connect the ends of the island group to each other on both the NW and SE sides. I have only one very small suggestion for improvement - maybe add a small line showing that Store Hill and Flatt's Village are connected; it isn't instantly apparent. Although I an see what you mean, there isn't really a need for it as Store Hill shares a land boarder with Flatt's Villages, even though it isn't a boarder the piece of land with the number in it. However, do you want to add lines from Flatt's Village to both of Harrington Hundred's Road and Bride Hill as well? That would be hard considering Bride Hill is a landlocked territory. Review by Christian 'Thor' Picard on 1/3/2015. Clever map where a good start is in no way a guarantee of success. The design forces us to be on an offensive mood since this map is fast-paced. If you stall at some point, the other players/AIs will benefit of it... against you. Review by G_GR on 12/24/2014.